The party returned to the dungeon inside The Crow — one of the ancient Thassilonian pillars that once supported a massive bridge into the middle of the sea. They continued their search for the next shard of the Shattered Star. They visited the deepest level they had reached before, where they had argued over whether to press on into a tunnel, decided to rest, but were soon ambushed by a force of mites. They traveled several hundred feet down the tunnel, where they found a side door that opened into a set of stairs that led down into the ocean water. A strange shimmering blue aura covered the water, which had no ripples. The barbarian Grog led the way as the party stepped down the stairs and walked through a tunnel that led outside into the ocean depths surrounding the Crow! 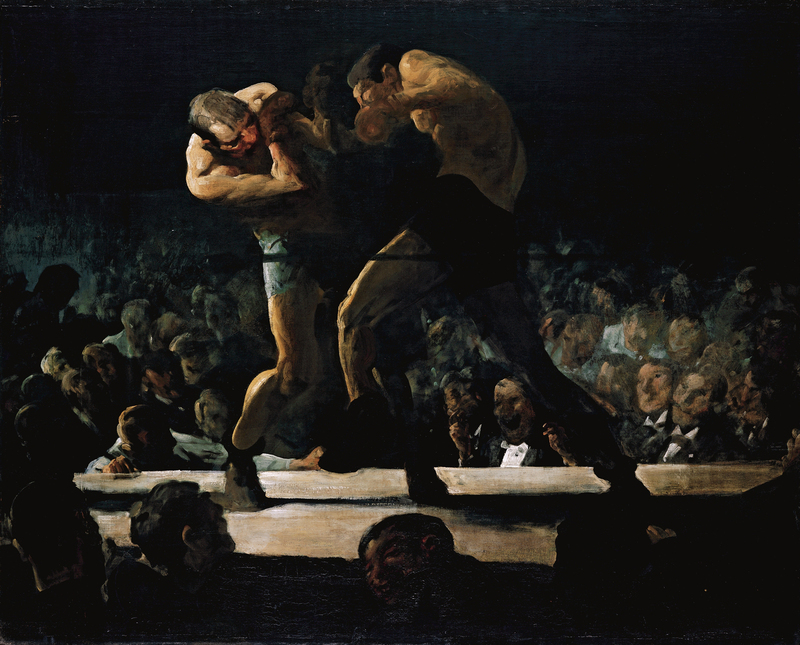 Henri threw flasks of alchemist’s fire into the whirlwind of masks. He and the rest of the party destroyed it before it could affix one of its masks on another member of the party. The room was still slick from Lard’s self sacrifice. Katrina and Lillian entered the far door and found an opulent chamber. Apparently, this was where the leader of the Temple to Razmir worked! They emptied the desks and shelves of most of their contents to gather all the evidence of the Temple’s shady dealings as they could. In the adjoining rooms, they found posh bedrooms that belonged to other members of the Temple’s leadership. But suddenly, the large trapped doors behind the statue room opened, and three hell hounds rushed in! The party, consisting of Glondorfin (druid) and his loyal frog Ulf, Grog (barbarian), Henri (gunslinger), Joshua (magus), Katrina (barbarian), Lard (cleric), and Lillian (ranger), proceeded with their night-time surreptitious raid of the Temple dedicated to Razmir the Living God. After silencing a lone guard, they proceeded into the basement’s main hallway, chancing upon a grey-robed Razmiran priest! When Henri rolled forward and tore a hole through the priest’s chase with his double-barreled hackbut, some white-robed acolytes peeked their heads into the hallway to see what the commotion was all about. 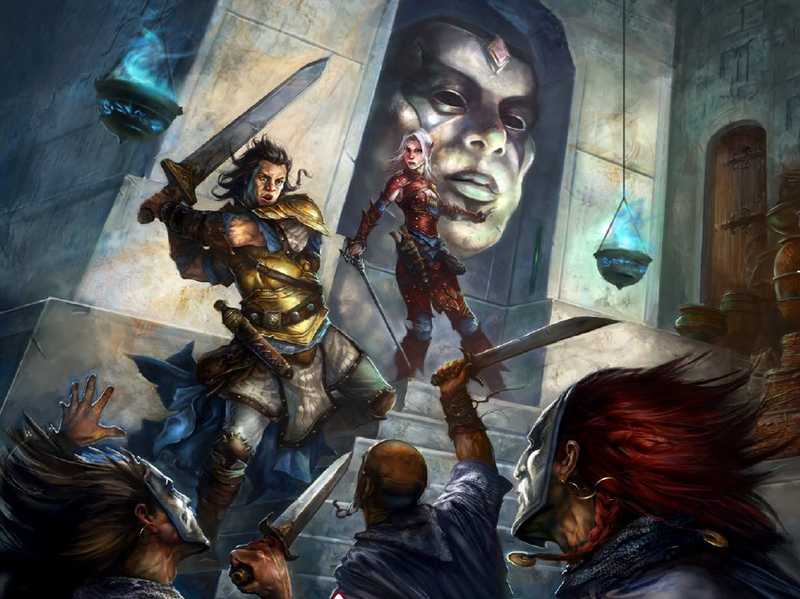 The party rushed into the hallway, compelling the acolytes to shut their doors out of fear. One more priest stumbled out of the dining room and was sliced apart by the party. The party then charged into the barracks, where the acolytes were waiting for them. Darting through and around the bunk beds, Grog, Lillian, Katrina and others knocked them out in fairly short order, hopefully not alerting the rest of the complex. Katrina then noticed, strangely, the door to the dining room swinging open on its own accord. After a moment’s hesitation, she lunged for the opening to see if an invisible creature had walked through. But she was too late. 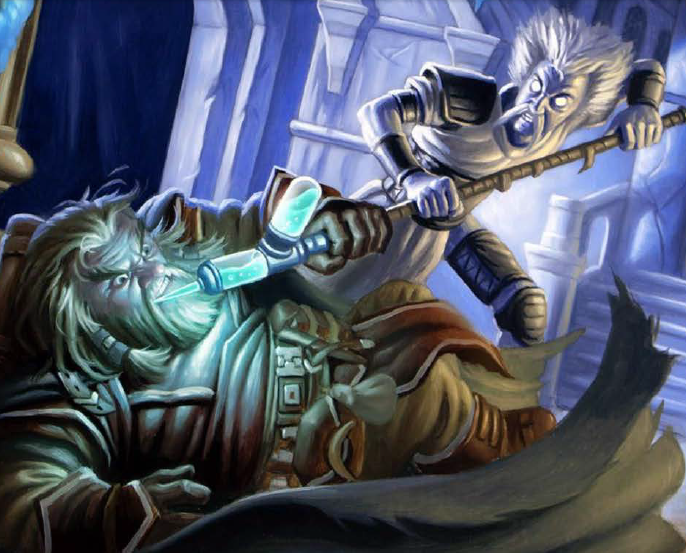 Blood continued to run out of the alchemist Wolf’s head, but a gray-robed priest of Razmir rushed up to him and staunched the flow with his magic. The barbarian Grog, still in rage, gloated his victory to the sky. Their overseer, the cultist Krant, handed him a bottle of wine and befriended him instantly. For the next two days, Wolf, the barbarians Grog and Katrina, the druid Glondorfin, the gunslinger Henri and the ranger Lillian did menial chores in the temple, including writing paragraphs of Razmir’s teachings, at one point being led out by the temple’s leader, Egarthis, to conduct a sermon during which the party had to distract citizens of Magnimar so that Razmiran priests could pick their pockets. However, while orating toward the audience, Lillian accidentally gave away that their pockets were being picked — drawing suspicion and resulting in their “sermon” earning no money that day. The party returned to the Pathfinder Lodge after lightening their load at Magnimar’s markets. There, the gunslinger Henri and the magus Joshua decided to take a short break from their adventures. Katrina had settled on yet another vocation–no, shooting bows no longer excited her, and no longer did worshipping Pharasma! She was now devoted to being a tank! She and the barbarian Grog hunched toward each other, giving each other approving grunts. Meanwhile, they found that Leo’s successor at the waffle shop was Lard, yet another adventurer in the family who was a cleric that worshipped Gorum, the god of battle! Sheila Heidmarch suggested that they visit the new ice cream shop in the Keystone District, to see what was up there. A large banner saying “Grand Opening! Free Ice Cream!” hung over the entrance to the ice cream shop, and a long queue extended out from its entrance back around the corner. Over the doorway hung sign saying “Cream Cubby” with a baby wolf licking an ice cream cone. When the party finally entered the shop after waiting in line, they saw a surprising sight: a half-orc with sharp tusks was handing out cones of ice cream. The customers were a bit suspicious, but were soon smoothing their tongues over the delicious ice cream. The various members of the party ordered different flavors. When the ranger Lillian approached the strange proprietor, she decided to scope him out. The party, after pursuing a small blue humanoid creature down a flight of stairs, had found itself in a giant crypt room filled with tall mounds of dirt. Oversized ants crawled out of them and attacked the party! Katrina questioned the wisdom of taking on the colony, as her companions charged in with bloodthirst. 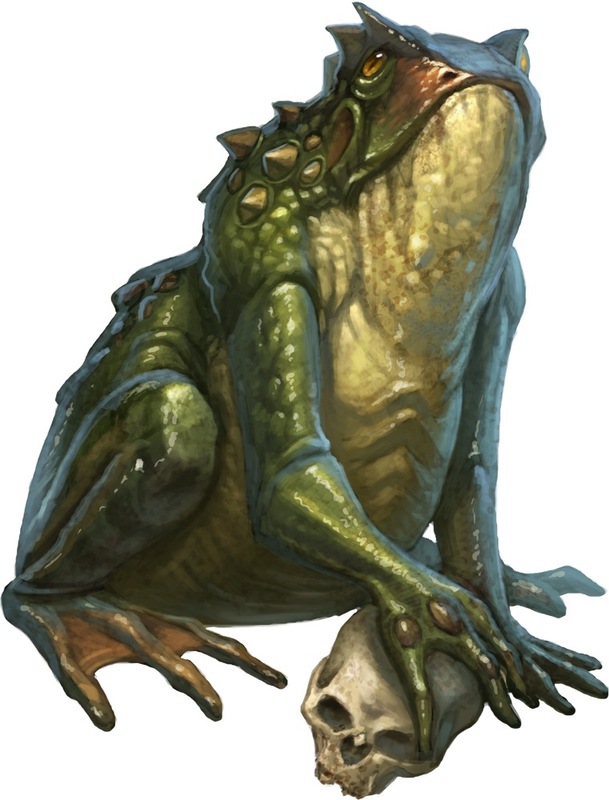 Glondorfin commanded his giant frog Ulf to attack the beasts, and it obediently fastened one of the insects with its tongue as the magus Joshua and the ranger Kevin pounded away at it with their weapons. Grog, as usual, took on the toughest of the bunch: a winged monstrosity that grappled him with its pincers. The battle with the leader of the Tower Girls, a wererat named Ayala Javeski, continued but was marked by a bizarre event. Two new companions appeared among the party: a dwarven druid named Glondorfin with a giant frog Ulf. Although a dwarf and therefore of a different race as the barbarian Grog (who was human), they bore a striking resemblance, as if they had been brothers in their previous lives. Henri the gunslinger, meanwhile, busied himself with the door puzzle, ignoring the battle altogether as if he weren’t there. Katrina stayed in the back of the fray, ready to aid her companions with her prodigious healing skills. Meanwhile, Grog, Lillian, and Joshua had charged through the door to engage a force of Ayala, three Tower Girls, and two donkey rats. Ayala looked a bit worried, realizing she perhaps should have ambushed the party from hiding places. Still, she sneaked past her foes with an uncanny grace, moved into position, and sliced the hardy Grog with a vicious swipe of her bladed scarf that sent him reeling.